Rupert Pupkin Speaks: M.I.A. on Blu-Ray Vol. 2: Scott Weinberg's Early 80s wish list! "" M.I.A. on Blu-Ray Vol. 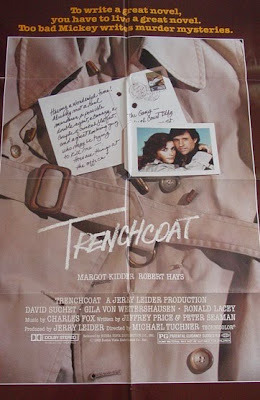 2: Scott Weinberg's Early 80s wish list! Here's a great guest list from the singular Scott Weinberg himself!! Random Early '80s Movies I Want on Blu-Ray! 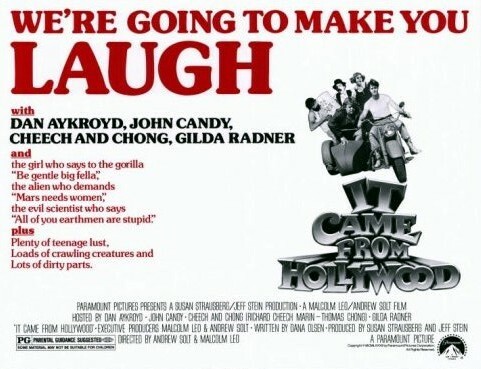 IT CAME FROM HOLLYWOOD (1982, Paramount) -- Dan Aykroyd, Gilda Radner, John Candy, and Cheech & Chong wise-crack their way through classics like The Amazing Colossal Man, Glen or Glenda, and The Crawling Eye. Not a hilarious film but it's interesting enough for the cast, the clips, and the fact that it predates Mystery Science Theater 3000 by a few good years. 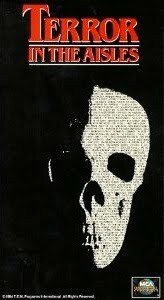 TERROR IN THE AISLES (1984, Universal) -- Donald Pleasence and Nancy Allen host a series of chilling (mostly Universal) clips, with lots of horror flicks (and the studio's recent Nighthawks) getting most of the attention. 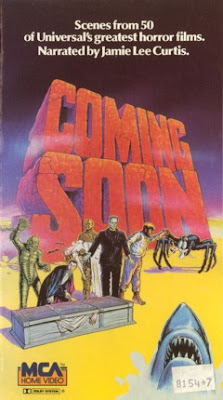 COMING SOON (1982, Universal) -- John Landis and Mick Garris collaborated on this collection of mostly older genre clips. I've never actually seen this hour-long piece, sad to say. 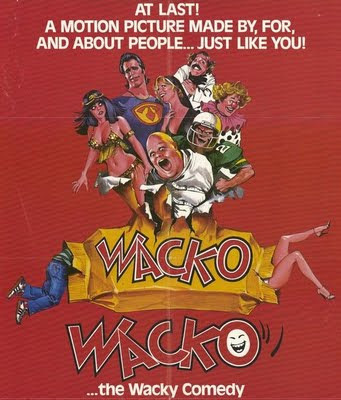 WACKO (1982, Vestron?) -- A ridiculously broad slasher spoof that nobody seems to remember, but it has Joe Don Baker, Stella Stevens, George Kennedy, Andrew Dice Clay, and the Lawnmower Killer. Even as a kid I knew this one was pretty freakin' bad, but I wouldn't mind a revisit with the Wacko. STUDENT BODIES (1981, Paramount) -- I've been sort of a scholar on this film ever since it first arrived. (Let's just say the credits have surnames in 'em.) Available on standard DVD, it's a fondly-remembered but very silly slasher spoof that features "The Stick", the gum, the paper clip, and (of course) the horsehead bookends. 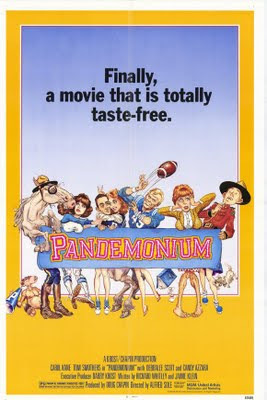 PANDEMONIUM (1982, MGM) -- Another flat little farce that aims to take a smack at the already-silly new horror trend, it features Tom Smothers, Carol Kane, Candy Azzara, Judge Reinhold, Phil Hartman, Eileen Brennan, and Paul Reubens. Yeah, weird. TRENCHCOAT (1983, Disney) -- Not sure why I'm including a light spy comedy with Robert Hays and Margot Kidder, but I just did. 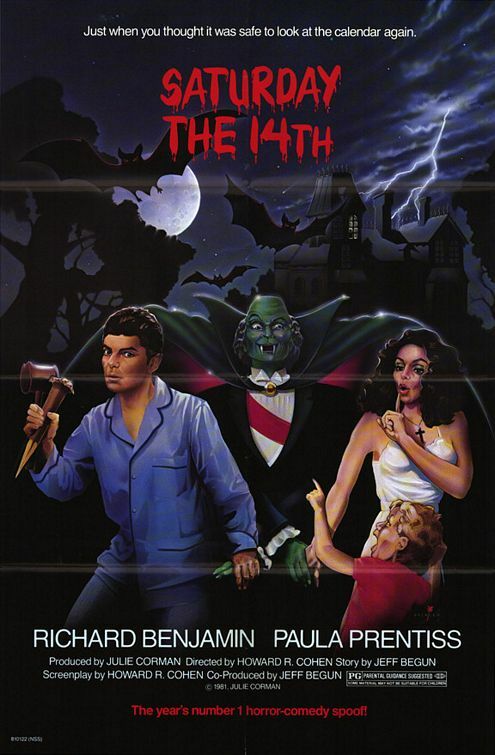 SATURDAY THE 14TH (1981, Embassy) -- Richard Benjamin and Paula Prentiss are the parents of a family dealing with issues straight out of The Addams Family. Or perhaps The Munsters. 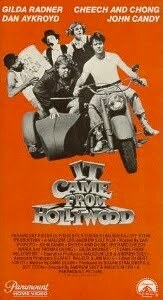 This one's hardly a classic but the 1988 sequel is outrageously terrible. I'd like to send out a big thank you to Scott for this fantastic list! Please check out Scott Weinberg's other writing at CINEMATICAL. These are really the dregs; I've seen 'em all and wouldn't waste my time seeing them again (maybe Trenchcoat). "Wacko" I believe is widely available (though not on Blu-Ray) under another title. 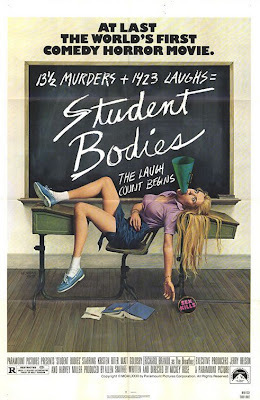 Student Bodies - isn't that famous solely for an appearance by Vanna White - or was that a similar film? Then again, thanks for reminding me there's a Saturday the 14th, Part 2! I'd forgotten that. Seeing Saturday the 14th made me think of Love At First Bite, which I've been wanting for AGES to get on DVD. Nice list! Love this list and Mr. Weinberg for graciously contributing to your blog. Look forward to your next guest post! I enjoyed COMING SOON, John Landis made it fun. Have to watch it again though. I would add 'That's Adequate' the Harry Hurwitz directed movie. Check out its' IMDB for the cast list. STEVE-Yes! SATURDAY THE 14TH STRIKES BACK! FORESTAKEN-Been meaning to rewatch LOVE AT FIRST BITE for a while! SLEESTAK-Thanks sir! Yes Iw as quite honored to have Mr. Weinberg contribute, he's a heckuva good guy! MARK-Yeah it's a bummer that the clip movies that Scott mentions will likely never show up on DVD cause of all the licensing costs. I must watch LOVE AT FIRST BITE on VHS then! TERRY-Great rec, I'd never heard of that film before! Sounds very enjoyable!